W.R. Case & Sons Cutlery Company and Custom Knifemaker Tony Bose continue their collaboration with the release of the Case Bose Eureka Jack, the nineteenth knife in the series. 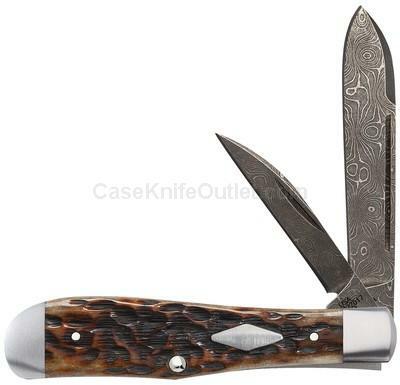 As with previous Case Bose calibrations, the Eureka Jack possesses all of the classic Tony Bose touches including flat taper ground Spear and Wharncliff Pen blades made of Damascus steel, stainless steel liners that are milled to improve the blade fall, and the Diamond shield is pinned on. Each comes with a genuine suede pouch. Production limited to 100 pieces made. As with all natural material color and texture may vary. Made in the USA.